Jordan Bell has been posting his translations of some of Euler's works on the arXiv. 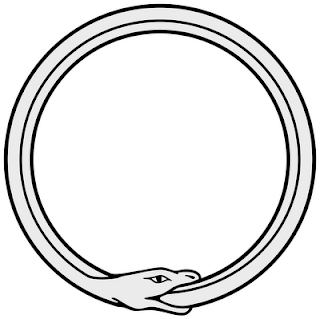 On the infinity of infinities of orders of the infinitely large and infinitely small. 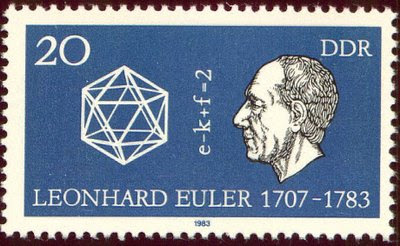 Bell has also written the paper Euler and the pentagonal number theorem. To find other Euler translations by Bell, you can search arXiv under Euler, or search at the Euler Archive, which links to the papers Bell and others have translated. Before starting this blog of bits of recreational math I had no idea about the wealth of math-related blogs that are out there. It turns out that there are lots of blogs provided by broad range of practitioners and enthusiasts. Each has its own particular lens, but taken collectively they give a surprisingly rich image of what mathematics is. I've put this first group of blogs into three sets: enthusiasts, expositors, and educators. Most blogs could be in all categories, the groupings are intended to reflect how I've interpreted the bulk of the postings. In the enthusiasts category there are professional mathematicians, educators, amateurs and writers who post on a variety of math topics in a way that is generally accessible. Brian Hayes writes a wonderful column "Computing Science" for American Scientist (for anyone who misses what Scientific American used to be like, this is what you should be reading). Brian correctly sees computing as a mathematical activity which is both practical and recreational. I think that many of his readers see his column as the natural successor to Martin Gardner's Mathematical Games column. A playful and interesting podcast and blog - mathematics exposition and promotion at its best. What can I do with my math degree? Where can math take me? Well, if you have ever wondered about these things, this blog and its accompanying podcast will help you find some answers. For numbers in the range of 0-9999, Tanya Khovanova's Number Gossip gives Wolfram Alpha a run for the money. Her blog presents interesting insight into mathematical life. The author of Euler's Gem provides a nice blend of technical and accessible posts, often with applets to demonstrate the concepts that he's discussing. In the expositor category I've put blogs by researchers and professional mathematicians who post about their current work, or subjects that interest them. Generally highly technical research-level mathematics. Terrance Tao is a Fields medal winning mathematician who's output is staggering (just count how many articles he contributed to the Princeton Companion to Mathematics to get a general idea). In this blog he talks about his current research - varied and intense. Fields medalist Timothy Gowers (editor of the Princton Companion to Mathematics, mentioned above) maintains a blog that ranges over the technical, the general and the personal. On the leading edge of online mathematics collaboration, another interesting math resource that he is involved with is the Tricki. Charles Wells provides a portmanateau of a blog that contains his thoughts on mathematics and language. Wells is the coauthor of Toposes, Triples, and Theories, a classic Category Theory text that is available free online, and author of the Handbook of Mathematical Discourse. A fascinating blog that really can be described as 'combinatorics and more'. The "more" is quite interesting - take for example the author's surreptitious involvement in the "String Theory Wars" as described in his recent book Gina Says. The pictures of children who evnetually become leading mathematicians are a surprisingly poignant element of Alexandre Borovik's book of the same name. Math educators blog about school math topics (where school could be K-12 or college), and about math education. The original home of the Math Teachers at Play blog carnival. This blog is a key hub for finding many other math-related sites and blogs. The "unofficial" blog of the Nazareth College math department. Their recent series of posts on ways to multiply should win some sort of award. What are all those math education journals saying, right now? Reidar Mosvold's synopses and pointers to papers are a great resource. If you ask Wolframalpha about its logo, it will tell you that it is a rhombic hexecontahedron. I had fun making one of these recently (here is a pdf of the pattern I used - you will need to print 3 copies onto card stock to make the model shown above). 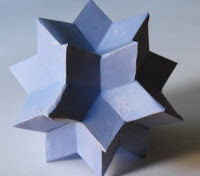 One neat thing about the rhombic hexecontahedron is that it is a stellation of the rhombic triacontahedron (described a bit in this post), and both polyhedra have the same type of faces - golden rombs (how unusual is it for a stellation to have the same polygonal faces as the polyhedron that it is obtained from?). A neat project would be to create a set of golden rhombohedra that could be used to build both the hexecontahedron and the tricontahedron. According to the mathworld entry, 20 acute rhombohedrons can be assembled to make up the hexacontahedron, and according to Coxeter (Regular Polytopes, page 27), you can build the tricontahedron with 10 acute and 10 obtuse rhombohedrons. Another construction is suggested by the 'ball of whacks' toy - which shows that you can build up the tricontahedron with 30 rhombic pyramids.